Viewing 24 of 47 items. A Stationery Studio Exclusive! 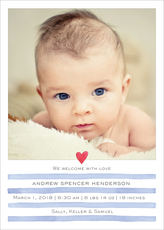 Announce your new arrival with these beautiful photo announcements. Matching blank white envelopes are included. This set of flat photo announcement cards are flat.. Announce your new arrival with these flat photo announcements. Matching blank white envelopes are included. 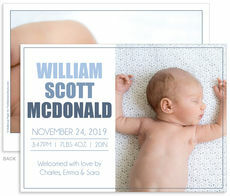 This set of announcement photo cards are flat printed in ink colors and typestyles of your.. Announce your new arrival in style with these photo announcements. Matching blank white envelopes are included. 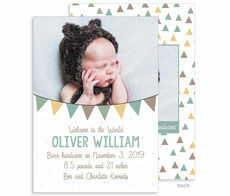 This set of flat photo cards are flat printed in ink color as shown with typestyles of.. 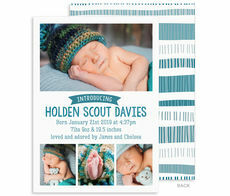 This set of photo birth announcements offer a wonderful way to share the news of your little bundle of joy. Includes blank white envelopes. Sized 7" x 5". Flat printed in ink colors as shown. 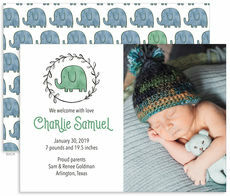 Your..
Set of 25 flat announcements featuring your photo with a mini polka dot design. The design and the personalization is imprinted with a letterpress method on luxurious 100% cotton stock. 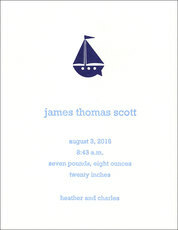 Card size is..
Set of 25 flat announcements featuring your announcement framed adorned with a sailboat design. The design and the announcement text is imprinted with a letterpress method on luxurious 100% cotton.. Announce your newest arrival to friends and family with this set of photo announcements. Card size is approximately 5" x 7". Printed return address in flat gray ink is available. Imprint is..
Oh, boy, it's a boy! Now it's time to announce the new little one to friends and family. We have a selection you will love! 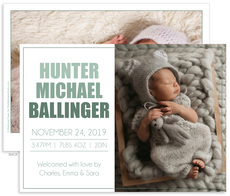 The easy part is picking something beautiful to introduce him and share all his details! 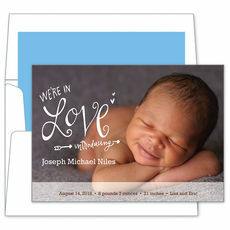 Your newborn son will be featured on an announcement of your choice and printed in the quality you will love. 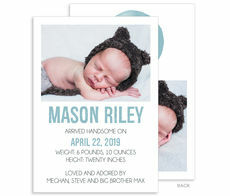 Our affordable announcements feature many styles perfect for the little guy including adorable graphics, color swashes, stars, checks, patterns and designs you will love. All your details will be printed with care. Usually we include your baby's full name, the birth weight, length, and time of his birth and the family's names. Many styles also offer printed return address and/or coordinating address labels. 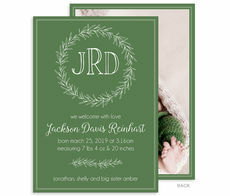 The envelopes on many styles can be lined in a coordinating color to the birth announcements for a handsome look. We also offer some wonderfully thoughtful personalized baby gifts too to keep your newborn's adorable name front and center in his nursery! Congratulations on your new baby's arrival and we wish you and your family every possible joy!